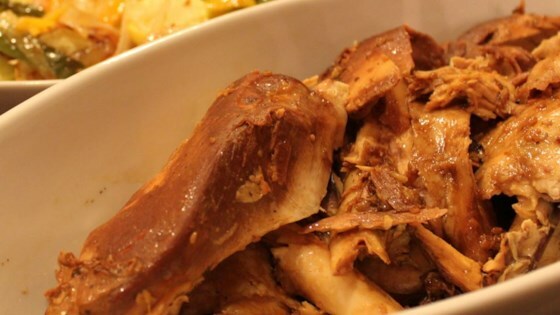 "A delicious and simple whole chicken recipe for the slow cooker. The sauce imparts wonderful flavor and tenderness, and is delicious served over jasmine rice." Remove skin from chicken, and empty inner cavity of contents within. Pat chicken dry with a paper towel, and place inside the slow cooker. In a bowl, stir together the chicken broth, soy sauce, olive oil, honey, Worcestershire sauce, balsamic vinegar, lemon juice, sesame oil, and minced garlic. Pour mixture over chicken, and cover. Cook chicken on low setting for 8 hours, or 4 hours on high setting. The sauce gives this whole chicken a rich, deep flavor. And it's so easy!